There’s an enthralling story about the Ten Commandments and the role they played in Jewish worship and the synagogue. It begins with a little-known fact. There was a time when there were not three paragraphs in the prayer we call the Shema, but four. The Mishnah1 tells us that in Temple times the officiating priests would first say the Ten Commandments, and then the three paragraphs of the Shema. We have several pieces of independent evidence for this. The first consists of four papyrus fragments acquired in Egypt in 1898 by the then secretary of the Society of Biblical Archaeology, W. L. Nash. Pieced together and located today in the Cambridge University Library, they are known as the Nash Papyrus. Dating from the second century BCE, they contain a version of the Ten Commandments, immediately followed by the Shema. Almost certainly the papyrus was used for prayer in a synagogue in Egypt before the birth of Christianity, at a time when the custom was to include all four paragraphs. Tefillin from the Second Temple period, discovered in the Qumran caves along with the Dead Sea Scrolls, contained the Ten Commandments. Indeed a lengthy section of the halachic midrash on Deuteronomy, the Sifri, is dedicated to proving that we should not include the Ten Commandments in the tefillin, which suggests that there were some Jews who did so, and that the rabbis needed to be able to show that they were wrong. We also have evidence from both the Babylonian and Jerusalem Talmuds that there were communities in Israel and Babylon who sought to introduce the Ten Commandments into the prayers, and that the rabbis had to issue a ruling against doing so. There is even documentary evidence that the Jewish community in Fostat, near Cairo, kept a special scroll in the ark called the Sefer al-Shir, which they took out after the conclusion of the daily prayers and read from it the Ten Commandments. Jewish sectarians—some identify them as a group of early Christians, but there is no compelling evidence for this—argued that only the Ten Commandments were binding, because only they were received by the Israelites directly from G‑d at Mount Sinai. The others were received through Moses, and this sect (or perhaps several of them) held that they did not come from G‑d. They were Moses’ own invention, and therefore not binding. So the rabbis were opposed to any custom that would give special prominence to the Ten Commandments, since the sectarians were pointing to such customs as proof that even orthodox Jews treated them differently from the other commands. By removing them from the prayer book, the rabbis hoped to silence such claims. But the story does not end there. So special were the Ten Commandments to Jews that they found their way back. Rabbi Jacob ben Asher, author of Tur (14th century), suggested that one should say them privately. Rabbi Joseph Caro argues that the ban applies only to reciting the Ten Commandments publicly during the service, so they can be said privately after the service. That is where you find them today in most prayerbooks—immediately after the morning service. Rabbi Shlomo Luria had the custom of reading the Ten Commandments at the beginning of prayer, before the start of Pesukei de-Zimrah, the Verses of Praise. That was not the end of the argument. Given that we do not say the Ten Commandments during public prayer, should we nonetheless give them special honor when we read them from the Torah, whether on Shavuot or in the weeks of Parshat Yitro and Va’etchanan? Should we stand when they are being read? Maimonides found himself involved in a controversy over this question. Someone wrote him a letter telling the following story. He was a member of a synagogue where originally the custom was to stand during the reading of the Ten Commandments. Then a rabbi came and ruled otherwise, saying that it was wrong to stand, for the same reason as it was forbidden to say the Ten Commandments during public prayer. It could be used by sectarians, heretics and others to claim that even the Jews themselves held that the Ten Commandments were more important than the other 603. So the community stopped standing. Years later another rabbi came, this time from a community where the custom was to stand for the Ten Commandments. The new rabbi stood, and told the congregation to do likewise. Some did. Some did not, since their previous rabbi had ruled against doing so. Who was right? Maimonides had no doubt. It was the previous rabbi, the one who had told them not to stand, who was in the right. His reasoning was correct also. Exactly the logic that barred it from the daily prayers should be applied to the reading of the Torah. It should be given no special prominence. The community should stay sitting. Thus ruled Maimonides, the greatest rabbi of the Middle Ages. 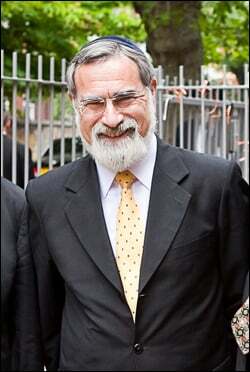 However, sometimes even great rabbis have difficulty persuading communities to change. Then, as now, most communities—even those in Maimonides’ Egypt—stood while the Ten Commandments were being read. So, despite strong attempts by the sages—in the times of the Mishnah, the Gemara, and later, in the age of Maimonides—to ban any custom that gave special dignity to the Ten Commandments, whether as prayer or as biblical reading, Jews kept finding ways of doing so. They brought it back into daily prayer by saying it privately and outside the mandatory service, and they continued to stand while it was being read from the Torah despite Maimonides’ ruling that they should not. Jews kept searching for ways of recreating that scene, by standing when they listened to it from the Torah, and by saying it privately after the end of the morning prayers. Despite the fact that they knew their acts could be misconstrued by heretics, they were too attached to that great epiphany—the only time in history G‑d spoke to an entire people—to treat it like any other passage in the Torah. The honor given to the Ten Commandments was the custom that refused to die. 10 commandments So this discussion is only 3000 odd years old. Is it not true that the Ten Sayings were actually given as follows. Two by Hashem and when the people could not take the force of hearing such sayings and their souls left then Moshes repeated the other eight. So maybe we should stand for the first two and sit for the balance..
10 Alone? The text summary if treated as the whole would truly be silly. Yet too, omitting such a concise part is not bettering. The 10=Kol. Ten Commandments of G-d and not from Moses. All the words of G-d must be reverenced including the Ten Commandments. I believe we must listen to our spirits and honor our maker in the custom that refuse to die. thank you Super interesting ! Any tradition that focuses you on the 10 ( and 603 commandments by extension ) has to be good. Recite it is good. Don't recite it and know that you are not reciting it is just as good. Stand and say it or hear it is good. Don't stand and say it or hear it is just as good. There may be other variations. It's all good, no matter whose rules you personally follow. In my congregation we don't do the 10 commandments. No problem. From this essay once i have chanted the Shema first line, and then mumbling the second line under my breath, while we chant the next paragraph ' Vehavtah et .. ." i will reflect that in some synagogues they are reciting the 10 commandments. Adds that integral concept to Judaism for my prayers. Standing/sitting for the Ten Commandments Thank you.